FRIDAY, OCTOBER 26, 2018 - Reserve your seats now! 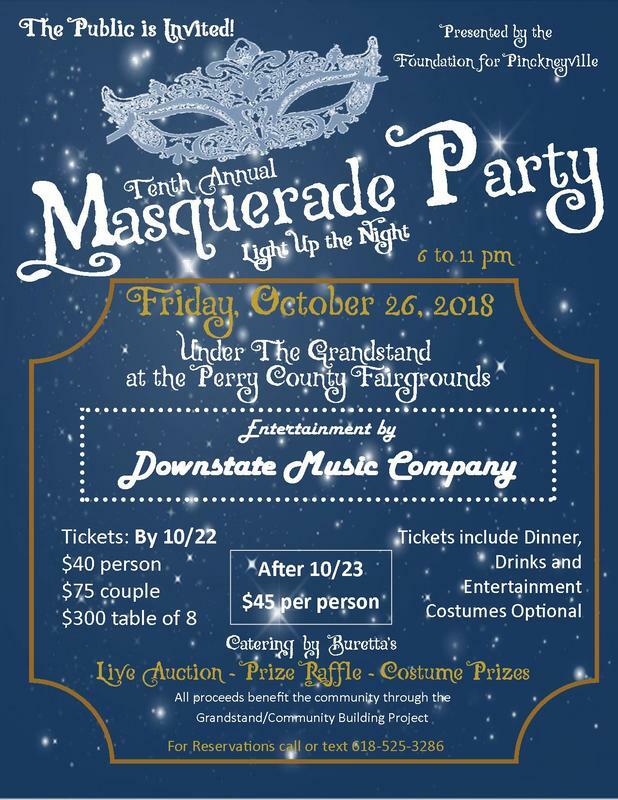 The 2018 Masquerade Party will be held Under the Grandstand at the Perry County Fairgrounds and everyone is invited. Entertainment by Downstate Music Company. Click here to go directly to the Masquerade Party page for more information! The Foundation for Pinckneyville recently announced that Keith Hagene has been elected President, succeeding Dustin Foutch who served in that role since 2015. The Foundation’s Board thanks Dustin for his service and wishes him well as he embarks on a new phase of his career in Breese, IL. The Foundation is a non-profit organization that focuses on projects to make Pinckneyville, IL a more prosperous and inviting community. The Downtown Revitalization Project involves constructing a second City Park on two properties the Foundation has purchased. The project has stimulated the construction of the first new building on the square in decades and is a key component of the potential rerouting of Illinois Route 127 to relieve traffic congestion. Funding was provided to help reinstate Art and Agriculture programs at Pinckneyville Community High School which were lost due to the State’s financial issues. The new Perry County Soccer Park received funding for a new restroom/concession building. Funding was provided to help resurface the softball/baseball fields at the City Park. A major contribution was made for the renovation of the City Swimming Pool. The land and buildings for the Illinois Rural Heritage Museum were purchased and donated to the Museum, allowing that organization to begin operation. Keith Hagene is a Pinckneyville native who currently serves as the Superintendent of Pinckneyville Community High School. Keith and his wife, Diane, have three children and three grandchildren. He has degrees in Architectural Technology from Rend Lake College, a BS degree in Education and Industrial Technology from Southeast Missouri State University, an MS degree in Education/Administration from Eastern Illinois University, and a Specialist in Education Degree from Eastern Illinois University. Keith is active in a number of local and regional civic organizations. 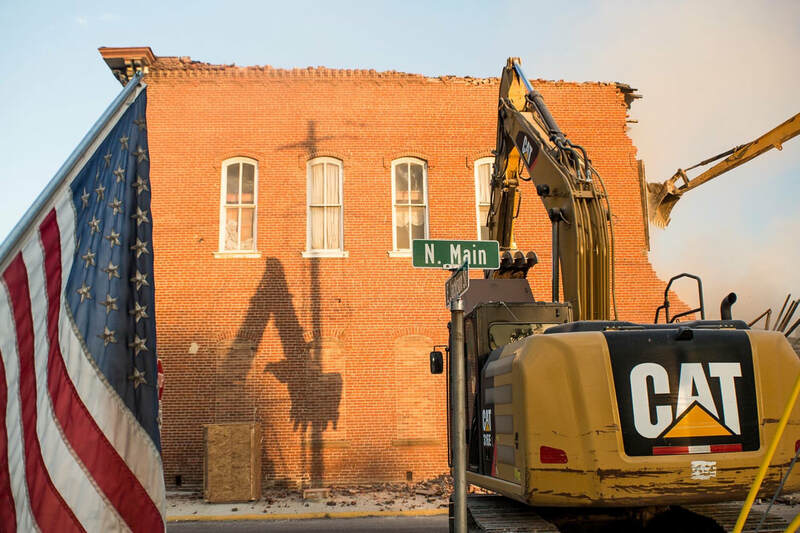 The Downtown Revitalization Project involves constructing a second City Park on two properties the Foundation has purchased north of the Perry County Courthouse. The project has stimulated the construction of the first new building on the square in decades and is a key component of the potential rerouting of Illinois Route 127 to relieve traffic congestion. ​Visit our Foundation Projects page for more information on the Pinckneyville Downtown Revitalization Project page. "Our goal is to make Pinckneyville a destination -- a community with quality education, state-of-the art healthcare and economic stability."